We were blessed to spend Christmas with Alma, an EWALU camp friend who is currently serving the ELCA in the Young Adults in Global Mission (YAGM) program in Israel/Palestine. She was a bangerang host and we were spoiled rotten by her hospitality and generosity! Enjoying her company in Bethlehem made it easier to be away from home for the holidays. We kicked off the holiday spirit one week before Christmas with a tree lighting service in Beit Sahur, a Palestinian Christian community right outside of Bethlehem. There were many scout marching bands (equipped with bagpipes!) and the Palestinian Prime Minister came to speak. We weren’t paying too much attention to what he was saying (all in Arabic) but definitely took notice when he said something about Newt Gingrich and several people laughingly glanced our way. Probably something referring to Newt’s declaration that Palestinians are an invented people. Thanks, Newt, for making us feel like fools. On Christmas Eve we went to Manger Square outside of the Church of the Nativity and enjoyed some more marching bands, as well as several concerts. 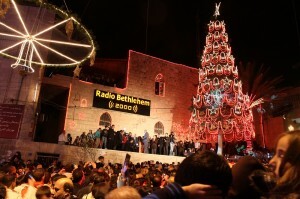 Before arriving in Bethlehem, I had a starry eyed and idyllic image of what Christmas would be like there. I was unprepared for the political overtones calling for peace that were interwoven throughout the celebration. 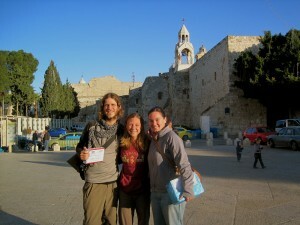 Political activists milled around the square, spreading information about freeing Palestine from Israeli occupation. A piece of wall in the shape of a Christmas tree was adorned with barb wire and fake hand grenades. That night we attended a Lutheran Church service in Bethlehem. It was a unique experience to come together with an international community and to sing Christmas carols in English, German, and Arabic! The evocative sermon focused on refugees throughout the world. The story of Mary, Joseph, and Jesus as refugees is a powerful image that the 130 Palestinian Christian refugees that attend the Lutheran Church in Bethlehem identify with closely. (We heard these individuals left Israel during rising conflict, locked their doors behind them and planned on returning when the violence calmed down. However, while they still have the keys to their homes they are no longer allowed to return and are now considered refugees.) The sermon focused on the hospitality of the people of Bethlehem who had taken Jesus’s refugee family in and called for us to continue to open our doors and hearts to “the other”. The pastor pointed out that the Christmas story could not have taken place in the same way today because Bethlehem is under Israeli occupation. The daily reality for both Christian and Arab Palestinians living near Bethlehem involves “walls that divide, security that intimidates, and policies that humiliate”. There is a huge wall through the town and to leave it (and enter Israel) you must pass through what can be an intense security process. The call to live “in an attitude which sees the image of God in the other” was tough to swallow in that environment, especially after witnessing some of the oppression Palestinians face. Christmas Day we were welcomed to the Jerusalem Lutheran Pastor’s home for a potluck meal amongst a spontaneous group of 30 people; all Christmas pilgrims who just wanted to gather with others to celebrate Christ’s birth. In the end, it was quite the memorable Christmas. We are eternally thankful for the bottomless depth of love, hospitality, generosity, and community that we experienced from both old friends and new acquaintances alike. We have learned so much about what it means to open your home to others and hope we can return the favor, or at least pay it forward, in the future. Written by: kate on December 28, 2011.on January 13, 2012.